Classical Greece! For any lover of history, this tour offers one of the best in-depth looks at the oldest European civilization. Combining the most impressive and awesome sites of Athens with the richness of Mycenae, Olympia, and Delphi; and passing through historic and beautiful landscape on the mainland and in the Peloponnese, this adventure does more than merely satisfy your historical interest. It is truly "a feast for the spirit and for the soul!" To satisfy your body as well, the tour continues on to Mykonos, where you can relax on its beautiful beaches and rejuvenate your body in its crystal-clear sea. Your visit to the Sacred Island of Delos brings you full circle on your Classical explorations. While the main focus of this itinerary is on the cultural and historical aspects in antiquity, the addition of a respite on Mykonos illustrates the wide diversity of this magnificent country. You'll also find two excellent museums on the island, well worth a visit. Both the Archaeological Museum and the Nautical Museum will give you an insight into another Mykonos before it was "discovered." Arrival at Athens International Airport. Meet our representative and transfer to your hotel. The remainder of the day at leisure. 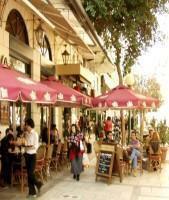 We suggest you visit the Old Part of town, the Plaka, and eat at the traditional "tavernas." If you arrive before noon, you have the chance of visiting the National Archaeological Museum with its unique Pre-historic Collection. Overnight Athens. After breakfast, depart for your sightseeing tour of Athens. Visit the Tomb of the Unknown Soldier at Syntagma Square, the Royal Palace, the Temple of Olympian Zeus, The Thesseum, The Greek Orthodox Cathedral, the Flea Market of Monastiraki, The Academy, and, last but not least, the Acropolis and the outstanding New Acropolis Museum. Return to your hotel. Overnight Athens. After breakfast, begin your Classical Tour of Greece. 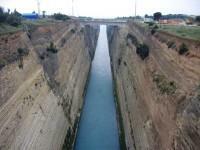 We'll travel by the coastal road to the Corinth Canal, where we'll make a short stop. We'll continue to drive on and will next visit the Theater of Epidaurus, famous for its remarkable acoustics. Then we proceed to the Town of Nauplion, where we'll have a short stop, before continuing on to Mycenae to visit the Archaeological Site and the Tomb of Agamemnon. 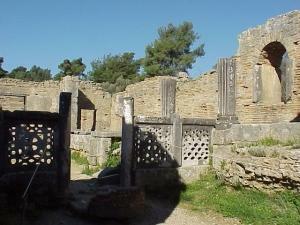 Afterward, we depart for Olympia, traveling through the Central Peloponnese and the towns of Tripolis and Megalopolis. We'll have dinner at Olympia, the Cradle of the Olympic Games, and have an overnight. In the morning, we begin with a visit of the Archaeological Site with the Sanctuary of Olympian Zeus, the Ancient Stadium, and the Archaeological Museum. We will then continue our drive, traveling through the plains of Elia (Ilia) and Achaia until we reach the magnificent new bridge crossing the Corinthian Bay from Rion to Antirion. Passing by the picturesque Towns of Nafpactos (Lepanto) and Itea, we arrive in Delphi. Here we'll have dinner and an overnight. In the morning we'll visit the Archaeological Site and the Museum. 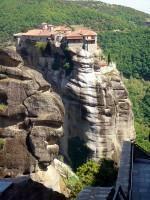 Later, we depart for the town of Kalambaka, a small town situated at the foot of the astonishing complex of Meteora, not far from its gigantic rocks. We'll have dinner here and an overnight. Today we have our long-awaited visit of the Meteora Monasteries, situated amid striking scenery, with the ageless monasteries perched on top of the huge rocks. Seemingly suspended between heaven and earth, and between time and space, the monasteries are the keepers of exquisite specimens of Byzantine Art. We return to Athens via Trikala, Lamia, and Thermoplyae, where we stop to visit the Leonidas Monument. Our arrival in Athens will be early in the evening. Overnight Athens. After breakfast, meet our representative and transfer to the port for your afternoon departure by ferry (or Highspeed boat) to the magical island of Mykonos. Meet our representative and transfer to your hotel. The rest of the day and evening are at your leisure. We suggest you explore the maze of tiny streets and wonderful shops of Mykonos. You might save your first taste of the famous Mykonos nightlife until the following night, since your Delos visit tomorrow will be early. Overnight Mykonos. After breakfast, meet our representative and transfer to the port for your departure to Delos. 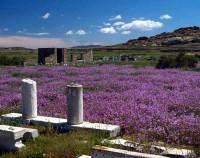 Your guided tour of Delos includes all of the amazing remnants of this remarkable civilization. After the tour, you'll have free time to continue your own explorations of this vast site, including the incredible indoor Museum. The last boat returns to Mykonos at 15:00 (sailing time takes only 30 minutes). 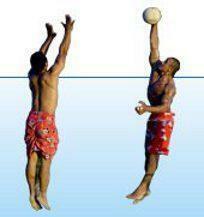 Afternoon and evening at leisure for relaxing, swimming, nightlife! Overnight Mykonos. Two full days to explore this incredible island, or to simply relax at one of its many outstanding beaches and recharge your batteries! For the very active, you can explore the island by motorbike, car or jeep, or sit back and enjoy a guided tour. You'll have two more nights of non-stop fun on the island that never sleeps! 2 overnights Mykonos. After breakfast, transfer to the Mykonos Airport for your flight to Athens, in time to connect to your international flight home.